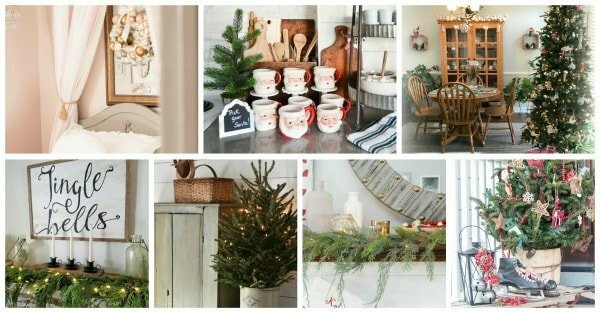 Welcome to my Christmas Home Tour 2017! Well, part of it anyway. I’ve had a lot going on behind the scenes here lately and I’m a bit behind this year! I did manage to get my family room all decked out for Christmas. As I mentioned last week when I showed you my DIY Christmas book covers, I’m sticking with a simple decorating theme this year. 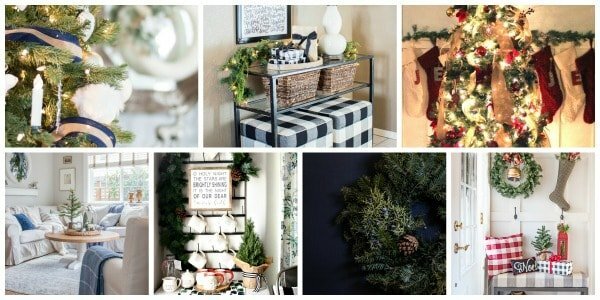 A big thanks to Jenna from Wife in Progress Blog for organizing this Home for the Holidays hop! My Christmas mantel is similar to last year. I’ve kept the gold taper candlesticks*, but added new rustic candle holders to put them in. The stocking holders are also the same, but I’ve retired the no-sew Christmas stockings that I made a few years ago in favor of these sweater style stockings. I usually put my Christmas tree in here, but we decided to put it in the living room this year. Instead, I added this faux little tree in place of a big tree. I wish I had bought more of these, I love it! All the greenery throughout my house is from one Port Orford Garland from Lynch Creek Farm. I break it up to stretch it out. 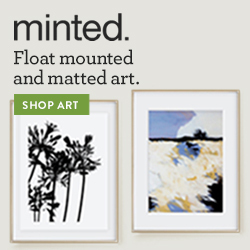 It’s enough to do two mantels and countless vignettes around the house. To keep things organized I used this galvanized metal bucket to contain my Christmas wrap and ribbons. Now when anyone in the house needs to wrap a gift, they know where to find everything. I added my cranberry garland and few springs of my Christmas garland so that it also doubles as decor. Functional and pretty! I found faux white hydrangeas with a little sparkle to them to add to the coffee table. I’ve never liked faux flowers much, but they are more realistic than ever before and with these I don’t have to worry about my cats eating them. Another idea for simple holiday decorating is to use your wrapped gifts as decor. I added a few of mine to my sideboard. Those little tea light houses are new this year, they are SO cute! In the center of it all, I added a nativity ornament which I found last year. This year I am fortunate to have two mantels to decorate, since we installed this vintage mantel in our living room over the summer. I especially love this, because I don’t have a TV above it limiting my decorating options. I was hoping to show you this space for today’s tour but my living room isn’t quite ready for its close up yet! Here is a sneak peek, I couldn’t resist buying this Jingle Bells sign when I saw it on sale! Next week I will show you the rest of this space (update see it all here!). In the meantime, there is no shortage of inspiration around here! Stop by the links below to see more Christmas home tours from my friends! *This post may contain affiliate links, you can read my full disclosure here. Thank you to Lynch Creek Farm for sponsoring the garland for my home tour! Roxanne, you home is so pretty! Looks festive and ready to welcome the Christmas season! Everything looks so festive and cozy!! 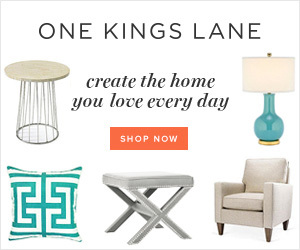 I love that ‘jingle bell’s sign – how cute! Roxanne – everything is so tasteful and festive, it’s beautiful! Thank you so much for participating in this blog hop with me and Merry Christmas! Roxanne, I love all your decor. Those bells, the stockings, the candlestick holders…everything is just so cute! Roxanne, great mantle with the natural garland. I love how you drape it across the top. That little tree is cute and can see how you wish you had bought more. A sweet and cozy setting for the holidays. Roxanne – I love that jingle bells sign! 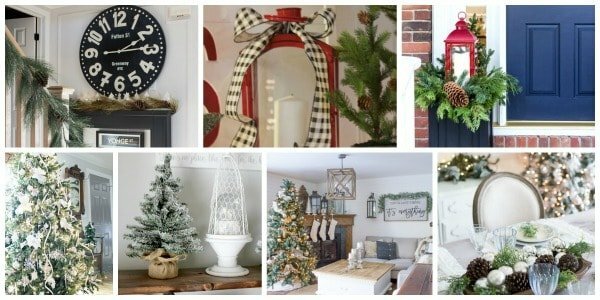 Your home is styled so beautifully this season! Such a pretty mantel! I love that Jingle Bells sign. Plus what a great idea to use the galvanized bucket for your wrapping paper storage! That jingle bells sign is so cute! I love how it all looks against the white. Beautiful! 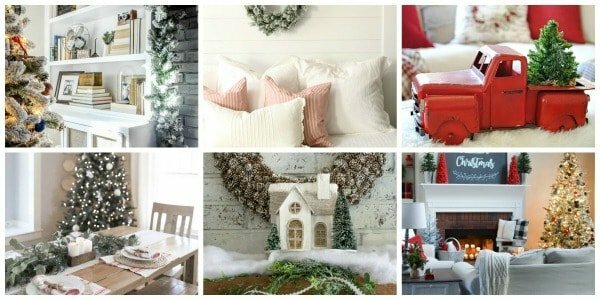 Your Christmas decor is all so gorgeous! Love the pretty fireplace vignette so much. Thank you Susan, Merry Christmas! I am officially obsessed with your fireplace! That skinny lap! And all the beautiful Christmas touches! Thank you Sara, Merry Christmas!